This blog post has been written by Sheharyar Rana, from Highams Park School, who is participating in the 2017-2018 ORBYTS Programme. On the 7th of November 2017 the ORBYTS programme began with a host of year 12 STEM (Science, Technology, Engineering & Maths) students meeting Katy from UCL and beginning to learn how to use LaTeX for their upcoming research project. The students on week one were given the task of constructing a small factual document on a given planet or moon from within our solar system. This included finding out what molecules make up the planets atmosphere, its mass, radius, distance from the sun, temperature and pressure. In my case, I was given the task of finding out all this information about Uranus, which turned out to be quite interesting especially due to the fact that there is evidence to suggest it rains diamonds!!! Furthermore we learnt more about exoplanets and how they are detected. This is because when they pass in front of a host star they cause a small dip in brightness which allows them to be detected. Depending on how big the dip is we are able to estimate the size of the planet: the larger the dip, the bigger the planet. How often it passes in front of the star allows us to estimate its distance from its star: the more often it passes in front, the closer it is to the star. This is very important as a planet too close to its star will be too hot for life to exist and a planet too far away will be too cold. 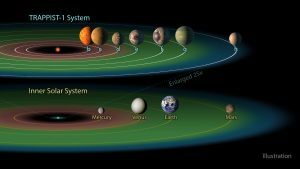 Therefore we need to find a planet which is in what astronomers call the “Goldilocks zone”, where the temperature is just right. Katy then also told us a little about the Twinkle space mission which is being primarily lead by researchers at UCL. Twinkle is a small, low-cost mission that will use spectroscopy to decode the light from hundreds of extrasolar planets. Twinkle will be able to reveal, for the first time, the chemical composition, weather and history of worlds orbiting distant stars. It is set to launch in 2020 and we look forward very much to hearing about all the scientific discoveries it makes.